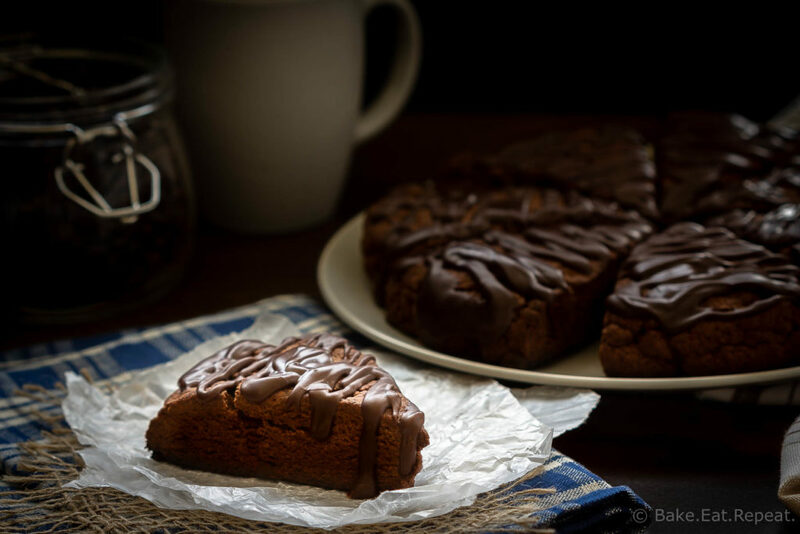 These double chocolate scones are easy to make and are decadent enough to be dessert, but since they’re scones you can probably justify having them for breakfast! Buttery and flaky chocolate scones, filled with chocolate chips, and topped with a chocolate glaze – in short, they’re amazing. Anyone else like having chocolate for breakfast? I have to admit that I justify that decision whenever possible. Chocolate in my muffins, my banana bread, my pancakes, wherever I can add some chocolate, you have to know that I’m doing it. These double chocolate scones could be taking it a little far. I’m not even sure that these are acceptable as breakfast food. There’s a lot of chocolate here. 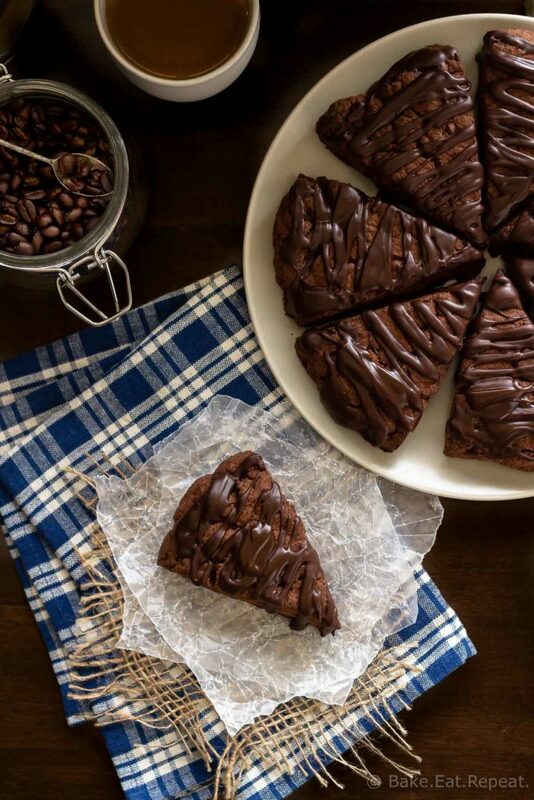 Chocolate scones, filled with chocolate chips, topped with a chocolate glaze….it’s a chocoholic’s dream happening here. So you don’t have to have them for breakfast. But I certainly won’t be judging if that’s what you do – I know that I’ve justified that decision more then once! You need coffee with something as rich and chocolatey as this anyways, so you might as well enjoy it with your morning coffee. That’s right. Totally acceptable breakfast food – because they’re good with coffee. Yes, this is how my brain works. Oh well. 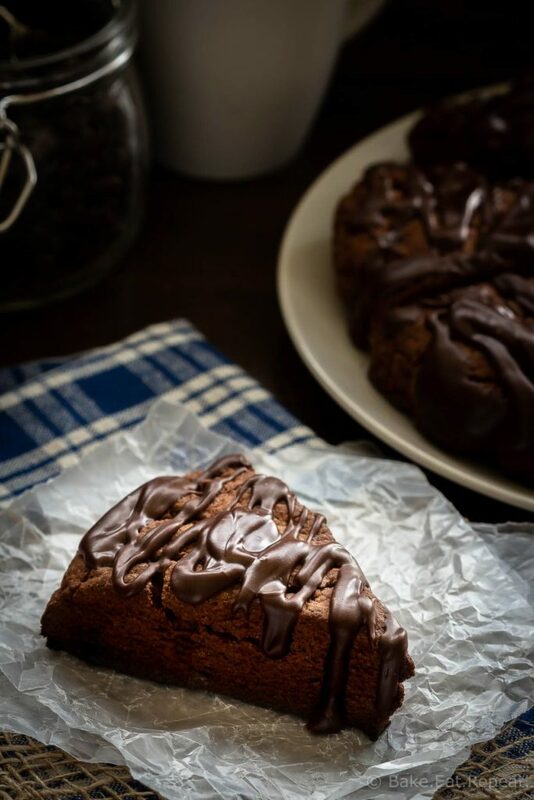 If you think about things in a more normal fashion and don’t eat excessive amounts of chocolate before 10am, these double chocolate scones would make a fantastic dessert or snack instead. However you choose to enjoy them, they are very simple to make. Mix them up in just one bowl, chill the dough briefly while the oven heats up, and then bake. There are two options for the glaze, either the softer, ganache style glaze that is pictured here, or you can use a glaze that is thinner and sets up for a harder finish. They’re both delicious so you can use your preference. 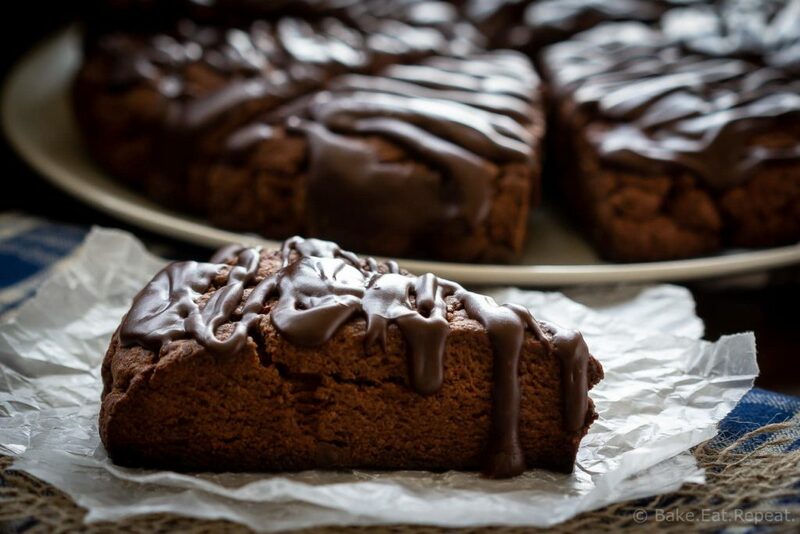 I’ve also shared this Double Chocolate Scones Recipe over on Food Fanatic. wow. I think these are scones I would like! Most of them are just too darn dry for me. it's good I'm not British!